The first and most frequently seen of the two, this choker has a diamond clasp one central round diamond surrounded by three rows of diamonds. The design has a lot of dimension when viewed from the side, and the four rows of pearls have a loose fit, sometimes appearing a little jumbled up in use. 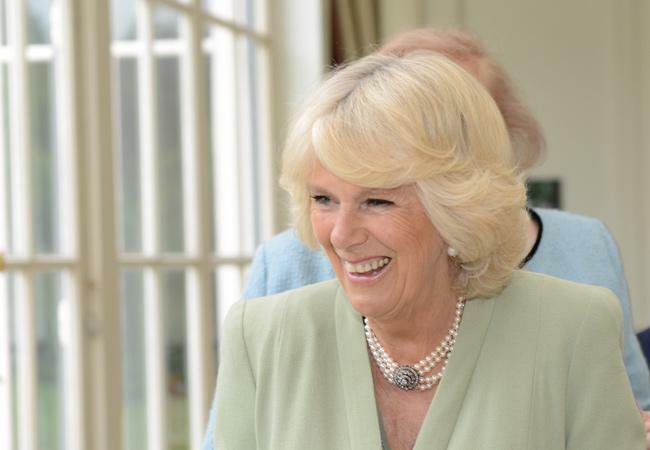 The Duchess has been wearing this necklace since early 2010 at least, and it has become a favorite over the years. 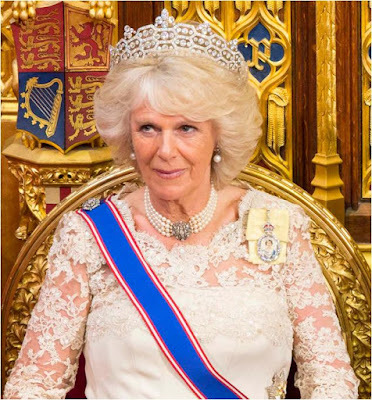 It was her most worn pearl choker and a frequent pick for day-to-day events, although at the moment the larger clasp necklace below has taken over the top popularity spot. The second option features a larger diamond clasp, with a more intricate design that radiates from the largest central diamond. 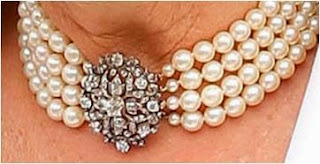 The four rows of pearls fit more tightly to the neck than the smaller version does, and each row has a smaller pearl just before the clasp. 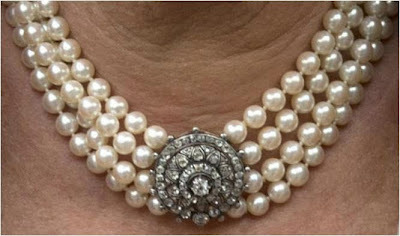 The Duchess debuted this necklace while visiting Norway in 2012, during a tour of Scandinavia with The Prince of Wales for the Diamond Jubilee. Since then, she's continued to use the necklace regularly for events with a higher profile, such as tiara events or day events like the Diamond Jubilee Thames pageant and the inauguration of King Willem-Alexander of the Netherlands. Recently, we've seen this necklace appear more often, which I always appreciate as it is definitely my favorite of the two.